British Shorthair - Silver Tabby] The British Shorthair, Great Britain's working cat, is, today, a sturdy and muscular cat with a short, plush coat. The breed was developed in Europe from non-pedigree cats. 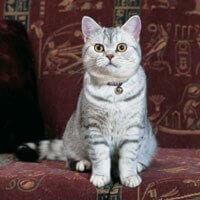 The British Shorthair's origins are those of the native working cats - the street and yard cats of Britain. The early British Shorthair and the French Chartreux were of similar type and many breeders think they were originally the same cat. Today, breeders have taken great care to produce two distinct breeds. Many shorthairs were shown at the famed Crystal Palace, in 1895, and they captured the hearts of the people at the shows until the Persian grabbed the limelight. British Shorthairs were then to remain out of favour until the 1930s, when a small number of dedicated breeders took an interest in them. In the United States the first of these cats were called British Blues as blue was the only recognised colour at the time and they were not as defined as the British Shorthairs of today. It is a medium to large, sturdy cat with a powerful body and a thick tail. British Shorthairs are very independent, yet extremely affectionate. They enjoy people and will happily follow their owners around the house. They are easy to groom because their fur does not tangle and should be combed very lightly. They make ideal pets for families and they equally at home with a person living on their own.